Most interesting part is in blue text below. Janet and I got rid of our television service earlier this year and we love it. We don’t even get the local channels anymore. I was raised without TV since my dad would not get a TV — saying “We will read in this house instead!” and I am forever grateful. Our kids never complained, in fact they like the house without TV too. We all find we can get a lot more done without it. What we do now is watch DVDs which we rent from Netflix. We have date nights, family nights and just watch good movies and shows for the fun of it. Our life is richer without television. Jimmy Akin introduced us to the series called Monk several years ago. We’ve rented those DVDs and even bought the first few seasons. Great fun! Then we discovered House M.D. At first I hated the show and thought “No doctor could be that arrogant and disgusting and get away with it in a hospital.” But a few friends liked it so Janet and I gave it another chance. Now we really enjoy House. He is arrogant, selfish, rude and self-destructive. But he is also brilliant, insightful, caring and usually the only one that can get through to people. You often wonder if reaches people in pain and suffering because they sense he can relate to them — and also because he is brutally honest and rude. 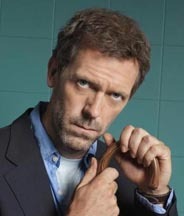 Everyone has a love/hate response to House — no one is without an opinion, not only the people around him in the hospital, but the viewer as well. He is a drug addict hooked on pain killers and unable to get close to people. The other main characters — mainly doctors and hospital administrators — are all screwed up, sexually immoral, and lonely. In spite of all this, our whole family has taken to these shows and they stimulate a lot of good discussion — not the least about how living such lives apart from God and his Laws, can leave a person alone, disfunctional and sad. But the moral, theological and philosophical issues raised make for great discussion — a way of stimulating discussion with adults and older kids — very real current topics to think about, wrestle with, and confront our secular culture about. Warning: I would NOT recommend this for younger kids. There is crude discussion and mature topics. It is for adults and mature teenagers. And even some adults will probably not appreciate the show. But these shows wrestle with philosophical and moral issues that other shows won’t touch with a ten-foot pole. House the existence of God, yet the topic comes up over and over again. He admits his despair and that he has no ultimate meaning for his life. The challenge of solving medical mysteries is an existential way of entertaining himself in the midst of an absurd, cruel and meaningless existence. He loves the challenge because it gives meaning to an otherwise meaningless existence. In one episode he treats a Catholic nun (which was very well done and respectful) in which they argue about God. She actually wins the discussion. In another show one of his doctors named Chase defends religion and reveals that he had been in seminary. The show ends with Chase standing in the back of a Catholic Church looking up at the tabernacle with a longing in his eyes. Abortion and the value of human life has surfaced on a number of occasions. In “One Day, One Room” House treats a young woman with a STD who is pregnant. House pushes her to get an abortion; the girl is a thinker and believes in God and the value of human life. The dialog is intriguing, but in the end she aborts. We were very disappointed. But then comes a great episode in which an older woman is pregnant with a baby that is literally killing her because of medical issues. House refuses to call it a “baby” and mocks those who do. He refers to the unborn child as a fetus (yelling “fetus” at others who refer to it as a baby, including the mother who refuses to give it up). He also calls the baby a parasite. Ultimately because of heroic efforts, Dr. Cuttey convinces House to operate on the baby in utero. 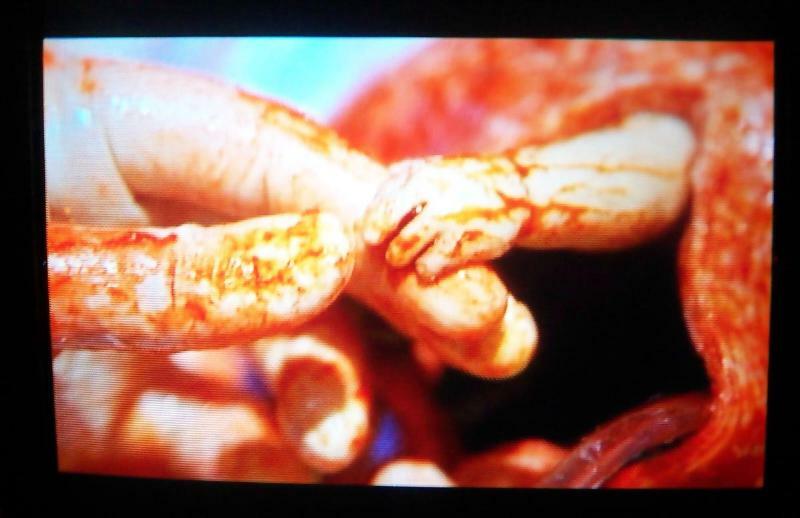 When House cuts open the womb a small hand reaches out and grabs House’s finger (click on picture for larger image). With hands covered with blood, House freezes as the miniature hand with minute little fingers grasps his large index finger. So, it is not just a fetus — it is a little human being grasping desparately — asking for House to save him. I won’t tell you how it ends, but House can’t get the “baby” out of his mind, referring to it absentmindedly as a “baby.” His staff looks at each other and comments something like “He called it a baby!” House keeps rubbing his hand and looking down at the finger which had been grasped by the baby. Quite moving. Anyway, thought I would share this with you.